1855: The Industrial Revolution is in full swing, powered by steam-driven cybernetic Engines. Charles Babbage perfects his Analytical Engine, and the computer age arrives a century ahead of its time. Three extraordinary characters race toward a rendezvous with the future: Sybil Gerard—fallen woman, politician’s tart, daughter of a Luddite agitator; Edward “Leviathan” Mallory—explorer and paleontologist; Laurence Oliphant—diplomat, mystic, and spy. Their adventure begins with the discovery of a box of punched Engine cards of unknown origin and purpose. Cards someone wants badly enough to kill for. 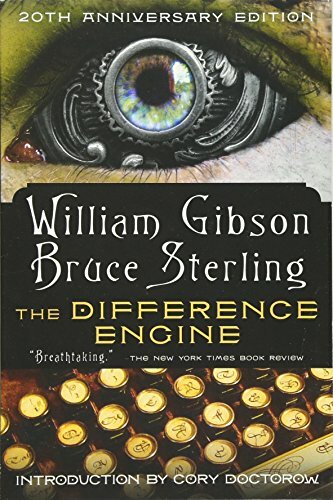 Part detective story, part historical thriller, The Difference Engine took the science fiction community by storm when it was first published twenty years ago. This special anniversary edition features an Introduction by Cory Doctorow and a collaborative essay from the authors looking back on their creation. Provocative, compelling, intensely imagined, this novel is poised to impress a whole new generation.